It was a busy end of the year with all the new product releases and announcements. We saw the release of the new AMD FX processor lineup which did not fair well overall, but still serves me well in my personal rig. However, a CPU is only as great as the motherboard to which you pair it. While many sites used the AMD issued ASUS Crossfire V 990FX boards for their initial reviews (a great board I might add) we were able to use something different for our tests. 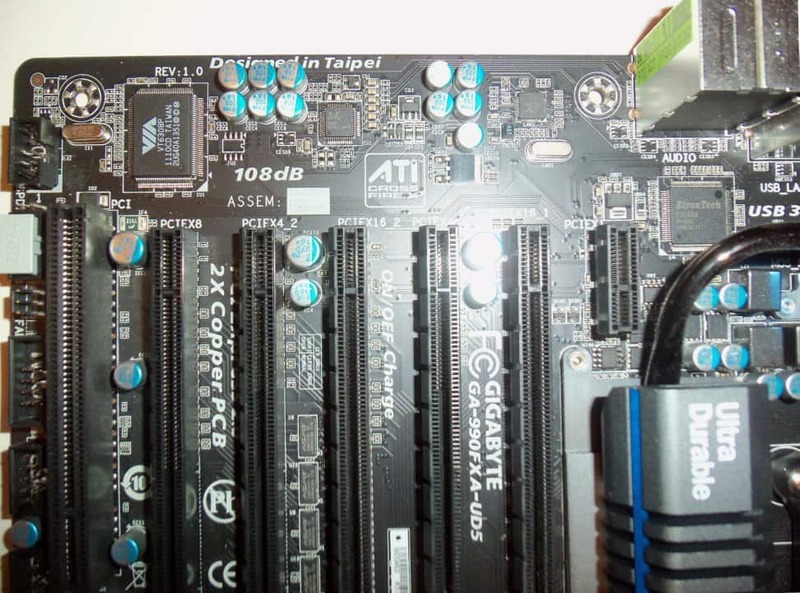 The GIGABYTE 990FXA-UD5 we found to be a very competent board, but let's take a closer look to find out what else this motherboard brings to the table. The biggest new feature of the AMD 900 series chipsets is the support for Nvidia SLI for up to three GPUs in a triple SLI setup. This is in addition to the support for CrossfireX for up to three GPUs. The board has a total of five PCIe 2.0 x16 slots with two fixed at x4 speed, one fixed at x8 speed, and two up to the full x16 speed. Above these slots is a PCIe x1 slot and below them is a single PCI slot for legacy devices like many audio cards. The board sports six 6 Gbps SATA ports connected directly to the AMD SB950, two additional eSATA ports (one being a USB/eSATA) on the back panel, and two more 3 Gbps SATA ports with the four additional ports supplied by two Marvell 88SE9172 controllers. There are a total of four USB 3.0 ports (two on the back panel and one onboard header) provided by two Etron EJ168 chips. There was no IDE as there was little room left after all of the above connectivity options. The other standard ports are mostly located on the back IO panel and include PS/2, Firewire, Ethernet using the Realtek 8111E, and HD audio using the Realtek ALC889, a COM port. 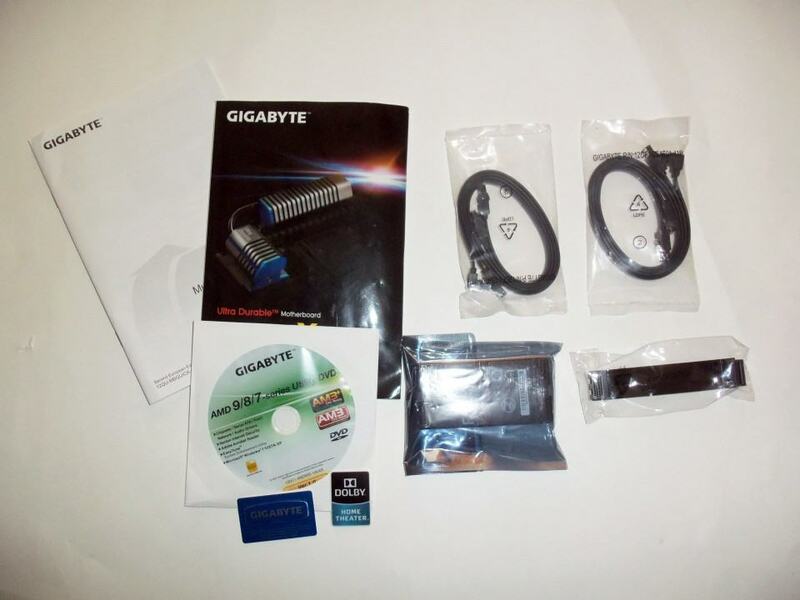 The GIGABYTE 990FX-UD5 also has support for the GIGABYTE TouchBIOS, Turbo XHD automatic RAID 0 tool, CloudOC, Ultra Durable 3 all Japans Caps, AutoGreen via Blutooth, and a dual BIOS system. Its as if every feature GIGABYTE offers was crammed into this board for a reasonable $179.99 US. The box of goodies is slightly different this time around due to the SLI support. The box still has your standard manual, quick installation guide, 4 all black SATA cables, two case badges, I/O back panel shield and driver disk. The standard package is topped off with two SLI bridges: A flexible bridge for two card configuration and a stiff bridge for 3-way SLI. This is a new package item for all AMD 990FX series boards. 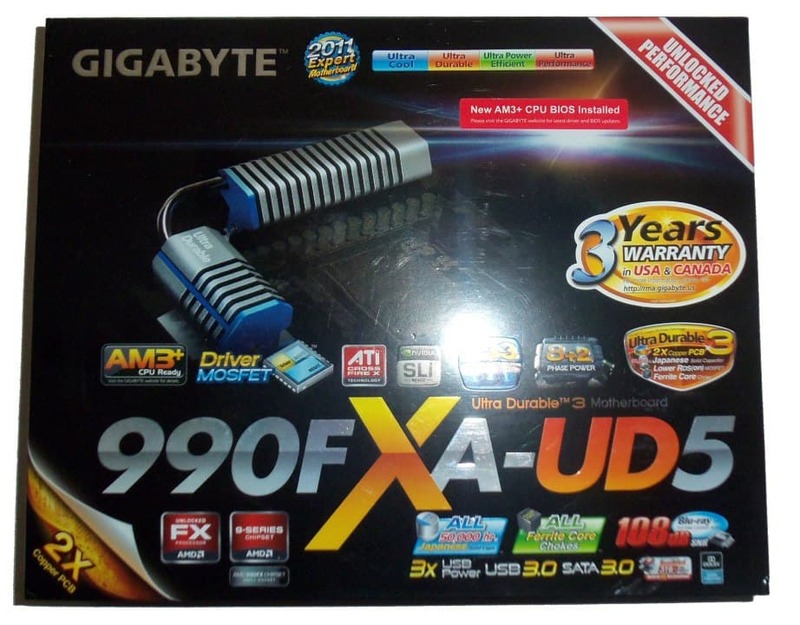 Another thing to note about the GIGABYTE 990FXA-UD5 is the black color scheme. Almost every other motherboard for GIGABYTE comes in a white box, while the UD5 box is mostly black with green highlights. It also sports a glossy finish instead of the flat matte color I am use to from GIGABYTE, though this may simply be reserved for their top of the line boards. I am using the same testing system I used during my initial AMD FX-8150 CPU review. The difference this time around is I added in audio and I/O testing for the GIGABYTE 990FXA-UD5 as well as updated drivers and software to bring things a little more up to date. As we all know, baseline performance of all boards on the same chipset is roughly the same so testing implementations of components that can vary is an important part of our revaluation. You'll see that we've decided to simply test the 990FXA-UD5 against its predecessor and price point APU sibling. We plan on reviewing both lower end and higher end variants of boards with the 990FX chipset onboard shortly so that we can make an even better assessment of this boards capabilities. But for now, this should serve as a starting point for anyone looking to make the jump from 890FX to 990FX. There is a lot of software involved when testing a motherboard. The motherboard in a PC easily has the most systems and interconnected components so we will need to cover a broad area of features. I will still try to narrow the focus as this board has been apart of the FX-8150 Part 2 review which covered a lot of the overclocking and CPU results. Now that we've established the testing equipment and software, let's get on with the testing and overclocking!